We have a pretty tech savvy household. In a technology driven world, we aim to help our students become informed technology users. Part of being a discerning user is balancing the production vs. consumption in your life. In our homeschool, we meet this goal with a variety of options. No matter what tools you choose for your technology, you have to prepare to maintain them. regularly cleaning out your machines – dust can hinder performance! Chances are the technology you choose may involve the Internet. Managing the Internet in Your Home is a series of posts by my husband which teaches how to set up access restrictions for Wi-fi devices of all kinds (except phones) and how to filter content at the router level using Open DNS. We can control access and content with our router which is useful. As our kids age, they begin to drop away some restrictions. It’s not totally bullet proof, but it’s a solid way to go – especially with so many tablets in our home. 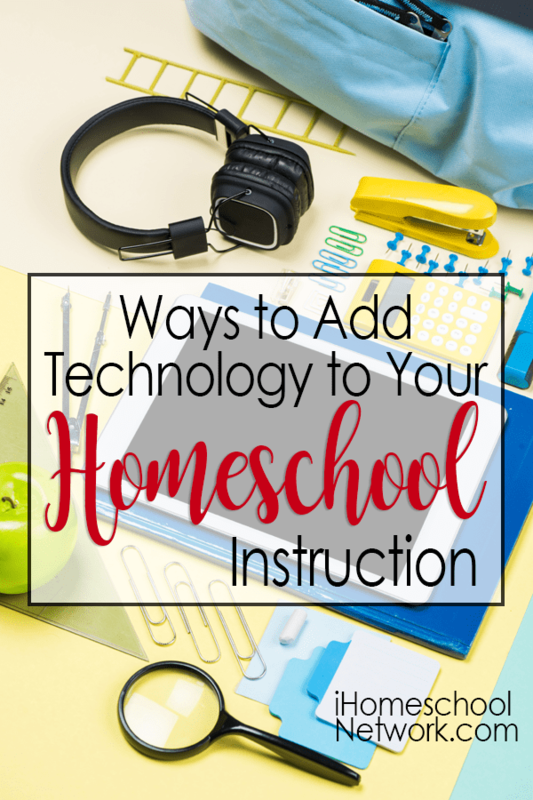 Technology can simplify and enhance our homeschool instruction. How to Use Google Earth in Your Homeschool– This virtual globe is a fantastic resource for studying the earth and it has a lot of capabilities. Best Educational YouTube Channels for Homeschoolers– Lots of great channels and videos here for you to choose from. There are a lot of talented people out there making wonderful educational videos for all ages. These are the ones we enjoy. Included in this post is how and when we will use this popular resource. How to Make a YouTube Playlist– Did you know you can make a custom playlist for your students? This is especially helpful for moms with younger kids. Must Watch TED Talks for Homeschoolers– These talks are well done 15-20 inspiring talks on a variety of topics. I made a short list of our favorites. 10 Podcasts for Your Inquisitive Teen– I made a list of some wonderful podcasts you and your teen will enjoy. 10 Best Podcasts for Curious Kids– Audio learners will love this list! Both of these podcast posts also talk about when our kids listen and we love podcasts. I’m a big fan of the Kindle Fire. Many families own an iPad or another tablet. If you haven’t entered the world of tablets, then the Kindle Fire is an economical way to take the plunge. Below are some reasons we love the Kindle Fire and the Kindle Paperwhite which is an e-ink reader. Easy access to books– If we need a book, less than 30 seconds later it is ready to go. Books in the public domain are free and cheap. Plus, we use the library to get eBooks on our Kindles. Internet browsing– My students do a lot of research and rabbit trail following. Having a tool at their fingertips means I don’t have to set them up with anything special. They can sit anywhere and work. Follow tutorials– Using a small device right at their table. This is so helpful for following along with hands on activities. Listen to audio books & podcasts– Do you have learner who loves audios? Watch videos– I like to find free documentaries for my students. For example, my high school sophomore and I watched the mini-series John Adams recently. 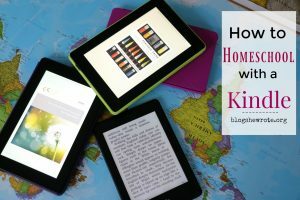 How to Homeschool with a Kindle– This is a big page dedicated to all things Kindle. I go into detail about the types of Kindles and the features of each of them which may surprise you. The T in STEM stand for Technology. So, one way we engage with technology is in our STEM learning. We have some specific technology goals and we try to get the tools that will help us accomplish our goals. 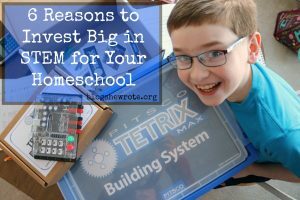 6 Reasons to Invest Big in STEM for Your Homeschool– if you don’t like the cost of STEM, let me convince you it’s worth it! Tips for Using a Digital Microscope– Many families want to invest in a microscope at some point in their home education. As a biology teacher, I find the digital microscope meets the needs of your students and it has a lot of advantages over its more standard counterparts. LEGO Mindstorms Education vs Home Kit– Which kit do you buy for your student? This post gives the details on the kits and which is best for the home environment. Resources for Teaching with LEGO Mindstorms– Books and websites to get your students challenged with their robots. How to Make a Marble Speed Trap with LEGO Mindstorms– you might enjoy this play-by-play on how to make a marble speed trap. What are your favorite ways to use technology in your homeschool? Heather Woodie is a homeschooling mom to four fantastic kids– two teens still at home and two off to university. She's a former middle and high school biology teacher who has embraced the independent nature of homeschooling and she mentors her children through authentic, student driven projects and learning adventures.